In this brilliant history of Prohibition and its most notorious gangster, acclaimed biographer Laurence Bergreen takes us to the gritty streets of Chicago where Al Capone forged his sinister empire. Bergreen shows the seedy and glamorous sides of the age, the rise of Prohibition, the illicit liquor trade, the battlefield that was Chicago. Delving beyond the Capone mythology. Bergreen finds a paradox: a coldblooded killer, thief, pimp, and racketeer who was also a devoted son and father; a self-styled Robin Hood who rose to the top of organized crime. Capone is a masterful portrait of an extraordinary time and of the one man who reigned supreme over it all, Al Capone. Peter Maas author of Manhunt This is rich American history. There was only one Al Capone, and he and his times are brought to life in definitive and engrossing detail. Nelson DeMille author of The General's Daughter Laurence Bergreen does a remarkable job of boring through the legends, the myths, and the misinformation, to reveal the true man. 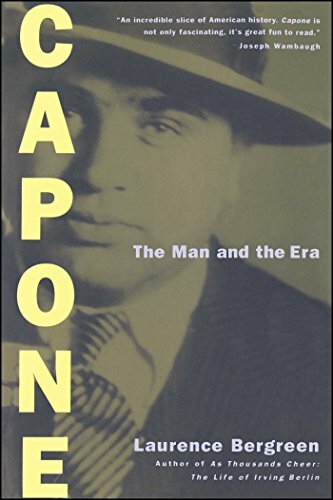 Capone: The Man and the Era is just that: an incredibly engaging look at the actual Capone, presented within a rich and evocative setting of time and place. Well written, well researched, surprising, and totally entertaining. Vincent Patrick The New York Times Book Review Certainly the definitive biography....Mr. Bergreen has written a book objective and rigorous enough to meet scholarly standards, yet colorful enough to engross the general reader. Richard Gid Powers The Washington Post Book World Laurence Bergreen's beautifully crafted biography of Capone transcends the true-crime genre to become a masterful study of a major figure in American history....This is a great story with all the trimmings. Laurence Bergreen is the author of two previous biographies, James Agee andAs Thousands Cheer: The Life of Irving Berlin. He lives in New York City.